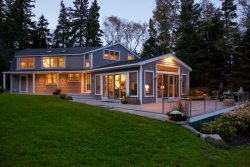 Overlooking Muscongus Sound, a secluded corner of midcoast Maine's Muscongus Bay*, the Clark family's Muscongus Landing promises an unforgettable Maine vacation. Awaken to the cries of seagulls as the morning sun streams through the window. Sip your morning coffee in the den while watching the lobster boats head out into the Bay for the daily catch. Walk next door and rent a kayak, watch the lobstermen unload, or buy tonight's dinner at the lobster pound. Launch your boat from our deep water dock and sail to Round Pond or Pemaquid Point. Kayak across the Sound to Hog Island and dig for clams. Experience the sights and sounds and smells of the ocean while you grill dinner on the deck. Enjoy the spectacular view and observe osprey, loons, seals, and herons with your binoculars from the comfort of the couch. Or just soak up the silence and the refreshing sea air as you unwind to the slow pace of the Maine coast. Muscongus Landing is the perfect choice for your next family vacation, romantic getaway, or reunion. We are located 75 minutes from Portland, Maine. Round Pond is only 2 miles away. A 30-minute drive will bring you to Camden; Boothbay Harbor is only 45 minutes away. You will love the quiet, peaceful setting and the countless activities right at your doorstep. *The Owners of Muscongus Landing manage the collection of deposit, lease and balance. Please inquire. Online bookings not allowed at this property. Bedroom 4 (1st floor): pullout couch – this is located in the den, but this is a private space and can easily be made into a bedroom. Cleaning requirements before check out: Please strip all beds and leave all used towels in the tub. Please remove all items from the refrigerator and wash dishes. All furniture and furnishing MUST be returned to the original location they were in upon check in. Please bag all trash and leave in receptacle provided. Check in and out times: Check in is 4:00 PM and Check out is 10:00 AM. Early check in/out are now allowed in the high season. Guests who have not vacated by 10:00 AM will be charged $25.00 every 15 minutes after 10:00 AM. Water access, beach access: This property is waterfront with a private dock, perfect for swimming fishing and boating. $200 CLEANING FEE, 9% TAX and $600 refundable Security Deposit is required.